The Jamaican flag - carried by jubilant runners in a victory lap around the track. Hoisted in a medal ceremony as the Jamaican National Anthem washes over a packed stadium. How often have we seen these images in recent times? Speaking for myself, it never gets old! Thanks to our athletes, the Jamaica flag has become an instantly recognisable symbol of our country. 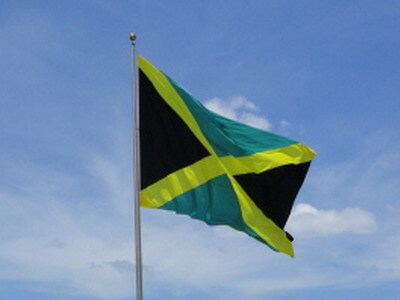 The national flag of Jamaica was 50 years old on August 6, 2012. In September of 1961, as a lead up to the island's independence in 1962, the government (PNP) announced a contest for the design of a new national flag. This would take the place of the Union Jack, which had fluttered over our country for 300 years of British rule. The debate over what the new Jamaican flag should look like was long and heated. There were those loyalists who wanted to keep the Union Jack. Others wanted to keep the colours but change the design, some wanted the same design in different colours. At the end of the contest period in March 1962, none of the final entries selected by the panel of judges was found to be mutually acceptable to both the government and the oppostion. Firstly, that different races should not be represented by different colours on the national flag, as this was thought to be divisive; that most former British colonies whose population was not primarily of British extract had chosen designs that were totally different from the Union Jack; that the colours in flags of the day were used for the emotional ideas with which they were associated. At the end of May, the committee reached an agreement on the design. The colours chosen were black, green and gold. The pattern was five horizontal bands of colour - a black band across the centre, one gold band above and one below the black, and green bands on the outside of the gold. This was also expressed as "Hardships there are, but the land is green and the sun shineth". Very poetic. And so it seemed that the new Jamaican flag would be ready for August. But then it was realised that newly independent (1961) Tanzania had an almost identical flag! This was with Independence Day barely two months away! A mad hustle followed, and eventually the committee agreed on the design we have today. It has been said that a Scottish priest, friend of Bustamante, sketched an outline of the flag of Scotland, and Busta recommended this design to the committee. Whether this is true or not, the Jamaican flag does have the same design as the Scottish flag, but with different colours. The final design was published in the Daily Gleaner of June 22, 1962. A gold saltire (cross) with black hoist and fly triangles, and green triangles at the top and bottom. It was a distinctive flag, the combination of colours and design making it easily distinguishable from the flag of any other country. On midnight of August 5, 1962, the Union Jack was lowered and the new national flag of Jamaica was raised on the stroke of Independence Day, Monday August 6. The principal ceremony took place at the National Stadium in Kingston, with smaller ceremonies being held in all the island's parishes. From the outset there were those who thought that the symbolism given to the black on the flag was too negative, especially given that the population of Jamaica is mostly black. And so in 1997, a special committee was named by Parliament to reconsider the national symbols. It was decided that the black should interpreted as "strength and creativity", and that the meaning of the flag should be expressed as "The sun shineth, the land is green and the people are strong and creative". Of course, in Jamaica you can never satisfy everybody - there are people like me who think that black is now being used to represent race, which is one of the ideas we were trying to avoid in the first place! Whatever interpretation you like, the national flag of Jamaica is a standout among flags. Both because of its design and colours, and because of talented Jamaicans who have caused it to be so well known the world over. When next you watch an international sports meet, check out who's waving the Jamaican flag - chances are it's not even a Jamaican!